UPDATE: It turns out our problems had nothing to do with the braking surface at all. The rim was splitting in two right down the middle. I didn't see this until I removed the rim tape. Click here for a continuation of the story. 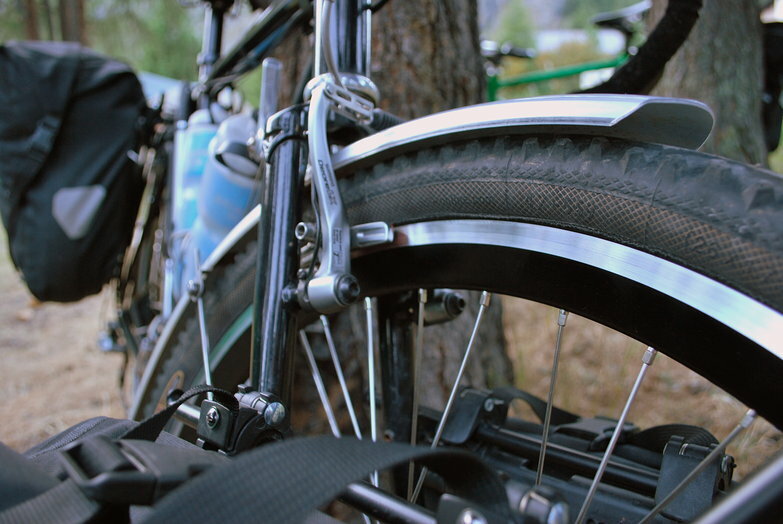 Roughly one hundred days ago, my rear rim, a Velocity Cliffhanger failed while we were climbing Julierpass in Switzerland. When we arrived at our campsite we discovered that Tara's rear rim was failing in exactly the same way. After contacting Velocity we were amazed when they immediately offered to replace both our rear wheels and our front wheels for free. Rather than sending us the same rim, Velocity opted to use their newly revived Chukker model, a "deep V" (refers to the shape) mountain biking rim. Two countries and nearly 3,000 kilometers later, Tara's new rear rim is failing. Like last time, there is an odd-looking crack in the middle of the braking surface and the rim is bowed out around it, making the use of her rear brakes impossible. When we contacted Velocity with this new problem they were immediately willing to help. Within days they'd built and mailed two new rear wheels, this time using their widest, thickest rim, the Psycho. I can't say enough about how great Velocity's customer service has been. I'm a little bummed that when we leave the Kerkennah Islands we'll be riding away on our third set of rear wheels in 9,000 kilometers. Before we left I did loads of research about what rims we should use, specifically hoping to avoid this very situation. I chose Velocity because of their high standing in the cycling community, and their Cliffhanger rims because they were the most heavy-duty offering at the time. When they failed in Switzerland all signs pointed to a manufacturing defect. This new problem seems to be the same defect again but since we've had a similar failure, now I'm scrutinizing our bikes. It is a simple fact that when you use rim brakes you are slowly grinding away the rim's surface. We're running Koolstop Salmon brake pads specifically to mitigate some of this effect. They are well known in the touring community for their rim-friendly material and impressive wet weather stopping. Since our first failure I have been obsessive about ensuring that our brakes are properly aligned and the brake pads clean. I can't see that in less than 3,000 kilometers Tara has worn down her rear wheel to the point of failure; especially given that 90% of our braking occurs on our front rims. We are carrying very heavy loads by any touring standards. Both of our bikes weigh in excess of 100 pounds and when last I checked, mine was well over that! I've never been too concerned about this; both Tara and I are lightweight riders, coming in around 130 and 140lbs. We know of cycle tourists who weigh more than either of us with our bike combined, so surely our heavy loads can't be causing the failures? I'm just not sure. One thought put forth in a thread over at Bike Forums was that tire overinflation could cause this sort of problem. That can't be it because we run 60-65PSI religously, a very low pressure. Another suggested that our rims, just one inch wide, were too narrow for our two inch wheels. This seems like a reasonable hypothesis; I can see how a heavy load would exert a lot of outward force on the sidewall of a rim half the width of its tire. I had raised this concern with Velocity back in Switzerland but they assured me it was fine. Even so, it seems like a reasonable suspect for the cause. In any case, our replacements on the way are the widest offering Velocity makes, coming in over a quarter inch thicker than our Chukkers. There is one sure way to prevent all of this supposed sidewall wear: disc brakes. I briefly considered this out of frustration when I realized we'd need new rims yet again. Ultimately though, it isn't an option. Our Long Haul Truckers don't have the braze-ons required to use them. There are exotic mounting solutions out there but I'm not willing to try them, especially given that our frames weren't designed for it. Apart from wheel issues, my motto of "simple, simple simple" for our bicycles has proven effective. We've had no other major bike-related problems after eight months on the road. Millions of miles have been logged touring with rim brakes and ours will join them, failures or no. The final hypothesis for all of this rim distress (har har) is simultaneously comforting and disconcerting. Maybe we've somehow managed to wind up with three dud rims. My rear rim seems fine and I am carrying the heavier load; why didn't it fail first? Though Velocity replaced our entire wheelsets in Switzerland, our front rims, which see the bulk of our braking, never had any issues. We even sold them to a bike shop before we left! It would be nice to know that we haven't done anything wrong but it would be even nicer to know that any time you purchase a rim from Velocity you're going to get a defect-free product. All of this considered, I'm still glad we have Velocity equipment. I don't know for sure what is causing the problem but I hope I can report a year from now that we've finally found a winning combination of tires and rims for our journey. Waiting around for wheels instead of riding isn't the most fun in the world, but thankfully my business is still booming. I have more work than I know what to do with to fill the time productively. Tara has been hard at work too, writing our journals and preparing some fun Christmas stuff which we'll post soon. No matter what happens, I know Velocity will keep us rolling, even if we're on a desert island in the middle of nowhere. Its some comfort to know you are having good customer service with Velocity..im sure there are some manufacturers who probably would not be quite so proactive! Lets hope the replacements prove to be trouble free. It seems very odd. We had rim brakes too and I got 5,000km on a single-walled super cheap Chinese rim that I bought in Syria, when our first rim failed. We aren't known for travelling lightly either. Maybe Velocity is having manufacturing issues? I've been meaning to write you two so see what rims you used! What did you have before your cheap rims and what did you buy after? How long did they last? It seems like a manufacturing defect to me but it was was helpful for my peace of mind to consider as many causes as possible. If there is anything we can be doing differently to prolong or prevent something like this I want to make sure we're doing it. In any case, I intend to take photos of our rims every 100km or so this time around. We'll see how it goes! Sorry to hear about your rim problems. The original wheels with the Ckiffhanger rims were built by Peter White cycles and the replacement wheels with the Chukker rims were built by Velocity so I think we can rule out any problems with the build quality. Looks like you have already covered all of the other possible reasons for wheel failure. I am thinking that maybe the deep V rims could be too stiff, no give to the rim so they just break. If you look at the cross section drawing of the rim, they all broke where the cross piece attaches to the brake surface. Looks like the Psycho isn't a deep V rim, maybe it will hold up better. The main problem with selecting wheels/rims is the lack of available data. Companies don't provide any specifications such as weight limit, or air pressure ratings for a specific tire size. Everyone has to try to guess which one is stronger based on the spoke count, weight and the shape of the rim. I am getting ready to build a new rear wheel this winter, I had just about decided to chalk your wheel failure up to an isolated manufacturing defect and use the Dyad rim. I am back on the fence now. I have always used cheap Sun CR-18 rims, never had a problem. Hope you have better luck with your new wheels. Would Velocity be willing to pay for the shipping of the rims back to them for analysis? They might be able to figure out why the rim continues to fail if they have it in their hands. Just a thought. Their customer service though is truely top notch. I'll definately keep them in mind when I decide to build our touring bikes! Have you considered drum brakes? I've got drums on my new trike and I LOVE-LOVE-LOVE them! Without question the best brakes I've ever had on a bike. They are incredibly powerful and everybody says they last forever, but the best feature in my book is that they are "sealed" so they are always dry. No squeeling or slippage when you're in the rain. Mine are Sturmey-Archer, and they don't require anything special on the bike frame. The brake cable just runs straight to the stopper-part connected to the hub. When I first saw how they worked, I was pretty amazing by how simple it all was. Have you considered whether the use of linear pull V-brakes vs cantilevers could make a difference in the way the brake pad presses against the rim? I have not studied the question myself, but did experience rim failure on a 20-inch rim/v-brake combo. I feel pretty confident in saying the problem is a combination of running heavy loads on tires much wider than the rims they are mounted to. Based on communications with other tourists who've had similar problems that seems to be the common theme. Our new rims are holding up well, hopefully I'll be able to report the same in a year! I like Velocity wheels. It seems strange that you have had cracking in the rims. I have seen gouges, score marks, and scratches from particles embedded in brake shoes, but not cracks. I have even dinged their rims heavily and straightened them back out with a folded cloth and vice grips, with no problems. Perhaps you got some duds, or you are mistaking rim gouges for cracks. Another thing that should make your lives much easier, is to use V-brake pads, (the common black one-piece types, not the cartridge shoe types) on road bike calipers. It gives squeal free braking and lots of control. Bad to read about such a serious recurrent problems. Good to hear they were gradual and not sudden catastrophic failures. I read something about anodizing possibly weakening the aluminum. Were your rims worn at the braking surface? I have Velocity Dyad rims on our touring bikes. After 10,000 Km of service including about 2000 Km of loaded touring with 37 mm tyres, much on dirt (corrugations, washboard to you?) and another 4000 Km loaded touring with 28 mm tyres (about 1000 Km gravel) I am just rebuilding the cheap hubs. The rims are fine but they have worn the braking surfaces by about 0.5mm across the rim. This can weaken the rim a fair bit. 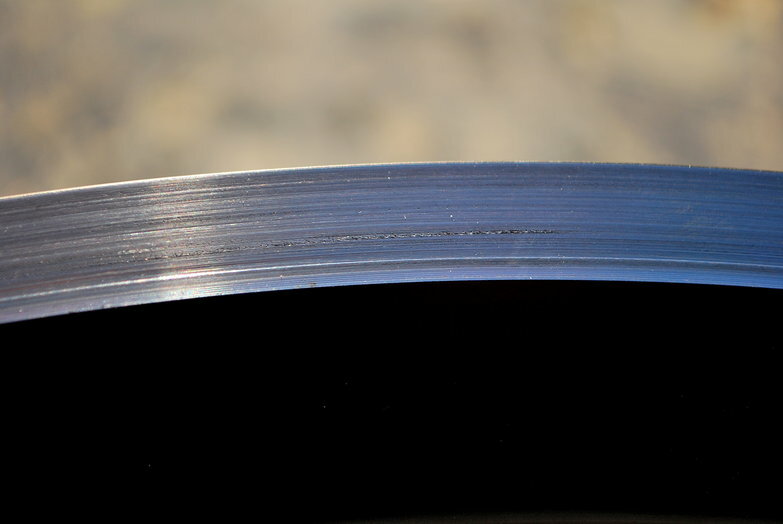 It is a little difficult to measure the thickness at the braking surcace under the clincher hook, but mine is around 1.4 mm, which should be OK for another tour or so and would correspond to a new thickness of about 1.65 mm. I didn't measure them new as I simply recorded the width across the braking surface with calipers as 24 mm. However you cannot generalise on rim wear. I have observed that a few loaded mountain descents in the rain in New Zealand can really rip into a rim on a touring bike, so the only certain check is to measure them frequently. It would be a lot worse on a tandem. I remember reading from Mavic's old website that their general wear limit is 0.4 mm per side (0.8 mm across the rim). I don't know Velocity's spec, so I just use the Mavic wear limit. Anyway, rim wear from braking, especially on wet descents, combined with wide tyres and a heavy load, will cause the type of fatigue cracks you have shown. Thorn cycles doesn't think 65 psi is very low for 2.0" tires on a narrow rim. In fact, they recommend no higher than about 50psi. Schwalbe also doesn't recommend such high pressures. See bottom of this page: http://www.schwalbetires.com/tech_info/tire_dimensions. The 70psi max pressure written on the side of the 2.0" Schwalbe tires only applies for wide rims. Thanks revelo, what a great link! That kind of detail direct from the manufacturer is really good to have. Velocity Cliffhangers and Velocity Chukkers are 28mm and 24mm wide respectively. While this is well over what Schwalbe defines as a narrow rim, our anecdotal experience suggests that neither is wide enough with heavy loads at 65PSI. We ultimately wound up with Velocity Psycho rims, which come in at 31.5mm wide. We rode them at 60-65PSI with very heavy loads for over a year without problems. We can't recommend them enough! Just fyi: there are two ways to measure rims: inner and outer width. 24mm outer width typically corresponds to 19mm inner width. All the widths on the Schwalbe page that I linked to above are inner widths. 19mm inner width is acceptable, according to that page, for 2" tires (50mm), but is a potential problem for 2.15" or above (54mm or above). So those Chukkers were cutting it close and thus needed lower air pressure. Glad to hear you finally got something that worked. This is all a moot point for me, because I stick to dirt roads if possible and thus normally want my pressures low anyway. I had the very same failure with my Velocity Dyad rear rim while in Germany. I had ridden across the USA and Germany, heading down the Elbe River when my back rim split in exactly the same way. I had to buy a cheap replacement in a small town and it failed by the time I'd reached Rome. I was planning to replace it with a Chukker, but now I'm just not sure. Maybe I'll go with Mavic A19. Any thoughts? Assuming you're heavily loaded and running wide (2"+) tires, the only rim I can recommend with confidence is the Velocity Psycho. They are the only thing I've personally seen that can withstand that lateral forces of that configuration. If my assumption is correct (heavy load, wide tires), I don't think your failure is a defect of the manufacturer: here is a similar failure on a Mavic XM719 (they wound up with Psycho's too). You just need a beefier rim.